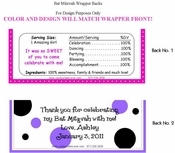 Your Bat Mitzvah Favors will be pretty in pink! Our BIG PINK CANDY BAR WRAPPER is the perfect SWEET token of appreciation. You will love handing them out almost as your guest love eating them.